Have an event or announcement to share? Know someone from H-B Woodlawn who won an award, honor or grant ? Complete the spread the word form. 1. Click this link above. 2. Select Download Secure Browser on the right. 3. At the bottom of the page right click on the link to "Download W!se Browser" and select "Download Linked File As"(Mac) or "Save target as"(PC) and select Desktop and then Save. 5. Click on the icon for wise_browser on your desktop to unzip the file, then click on w!se Browser to start your test. You will need to allow pop-up windows - Go to Safari-Preferences and select Security and uncheck the box for Block pop-up windows. If you are leaving APS, be sure to turn in all technology laptops, iPads, etc. with chargers to Teri before your last day. Check out the Junetime 2016 Catalog! Junetime is June 15-20. This year we will continue our educational experiment, enjoying some hands-on, project-based learning and a different structure to our school day. On Weds. 6/15, Thurs. 6/16, Fri. 6/17, and the morning of Mon. 6/20, regular classes will not meet, so that students and teachers can participate in mixed-grade seminars. This will give us a chance to teach and learn totally different things, and make connections with HB people we don’t usually get to spend time with. On Exposition Day, Monday afternoon 6/20, we’ll show each other what we learned during Junetime (named in honor of Juneteenth, the Emancipation Day holiday). All students need to sign the online AUP agreement before they can use school computers, devices or network services. Click here to see H-B's technology code of ethics and scroll to the bottom to sign the form. The School Board voted to move H-B Woodlawn to a new building in Rosslyn. For more information about the decision see the new section "The Future - New Building and Renovation" under the About Us tab. LOST SOMETHING? In order to help you find your lost or stolen items and to better track thefts at school, please use this form to report thefts and losses. If you find your stolen or lost item, please see Casey or Vanessa in the main office right away. We congratulate ALL students who participated in the Scholastic Awards! This year the Scholastic Art & Writing Awards received nearly 320,000 submissions and less than 1% of those submissions received National Medals. Submissions are juried by panelists who look for works that best exemplify originality, technical skill and the emergence of a personal voice or vision. The top works in the country earned National Medals and were celebrated at a ceremony at Carnegie Hall on June 3, 2016. 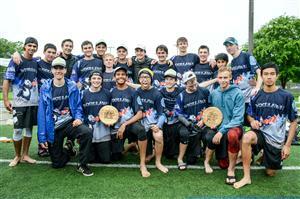 The HBW Boy's Varsity team won the 2016 USA Ultimate Virginia Boys' HS State Championship over Yorktown. Congratulations to all of our frisbee players. 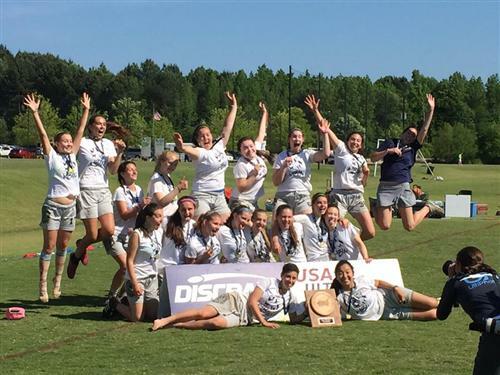 Our Varsity Frisbee players participated in the USA Ultimate 2016 High School Southern Regional Championships this past weekend (May14 & 15, included teams from Maryland to Texas) and did great! The guys came in 3rd and girls won 1st place! H-B Woodlawn junior Salome Gongadze was elected Youth Governor for the 2016 Virginia YMCA Model General Assembly at the 2015 Virginia Model General Assembly (MGA) held in Richmond earlier in April. H-B Art Student, Cole Goco received a National Gold Medal from the Scholastic Art Awards. He was honored at a June 11th ceremony at Carnegie Hall, NY. The awards ceremony was broadcast that night live from Carnegie Hall at 6:00 p.m. EST. Cole’s artwork The Island Adventure(Comic Art) will be on display in New York at the Sheila C. Johnson design Center, Parsons The New School for Design. The program, currently in its 92nd year, is a national program recognizing outstanding creativity in teens and offers scholarship opportunities for graduating high school seniors. Over the years, the Awards have grown to become the longest-running, most prestigious recognition program for creative teens in the U.S., and the nation’s largest source of scholarships for creative young artists and writers. A noteworthy roster of past winners includes Andy Warhol, Sylvia Plath, Truman Capote, Richard Avedon, Robert Redford, Joyce Carol Oates, Stephen King, John Updike, and many more. Please call or e-mail hbw.attendance@apsva.us as soon as possible. Include your student's name, grade, and TA and the reason for their absence/early dismissal/late arrival. 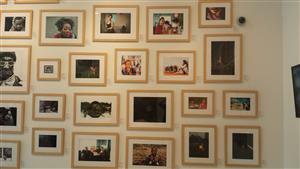 See all of our photos and slideshows on the Photo Gallery Page under Students. Watch the TV coverage from the cupcake event or watch a short video of the world being constructed. Congratulations to Eleanor and the entire 8th grade team of students, teachers and parents who made the event a sweet success!